Kanye West's messiah complex is leveling up — he's hosting an Easter service, and he's doing it at Coachella. It's a special edition of Sunday Service, the gospel-inspired series he's been leading for the last few months. Each service features both new and old music, with a gospel choir backing it all up. Fans have been able to follow the action via Kim Kardashian West's Instagram stories. "We were out in Palm Springs and they took us to a little campground, because we were thinking about a little performance in Palm Springs, just a little one. Then they had a mountain, He had a mountain waiting for us," Kanye told the Sunday Service crowd this past Sunday. "He had a date waiting for us. Only one date that mountain would be available to us: Easter Sunday at Coachella." 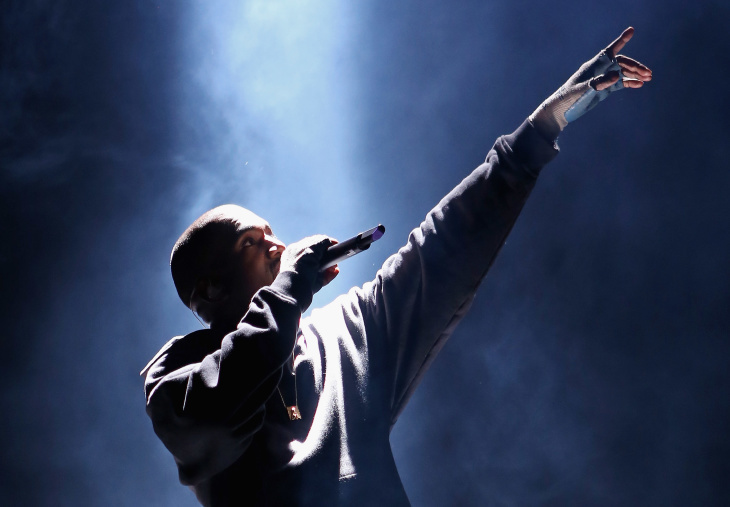 Those Easter vibes are being described by Kanye as a "sunrise service," though he may be using a liberal interpretation of "sunrise" — People reports that it will start at 9 a.m. (which is technically about three hours after sunrise, but who's counting?). "It's definitely something he believes in — Jesus — and there's a Christian vibe," Kardashian West said, "But there's no preaching." But, seeing as this is a Kanye appearance, there will most likely be some non-spiritual preaching about something. After negotiations reportedly broke down with Kanye over headlining the Coachella set, it seemed like he wouldn't be on the bill this year, but now he's back... in this last-minute addition. Unlike the rest of the Coachella lineup, this is a one-time-only event — only happening on the second weekend of the festival. Normally the same lineup repeats on both weekends. Full details are sparse — the Sunday Services thus far have often included special guests. They're invite-only affairs, but now there's a chance for everyone else to get in on the heavenly action. A limited number of additional Weekend 2 Coachella passes will be going on sale Friday afternoon at 3 p.m.